Last week we shared a turkey alphabet racing game that we did for a sponsored post with Alpha-Bits cereal. We had so much fun with our Alpha-Bits, that we decided to use them for another simple alphabet turkey matching game (unsponsored... and equally as cool). The activity is quick to put together and was enjoyed again and again as we added more stickers! It is also super easy to adapt for working on other skills like numbers and shapes. Then we colored with markers all over a piece of cardstock and then cut it up to make feather. Lastly we just taped the feathers onto the turkey's body and we were ready to start playing! 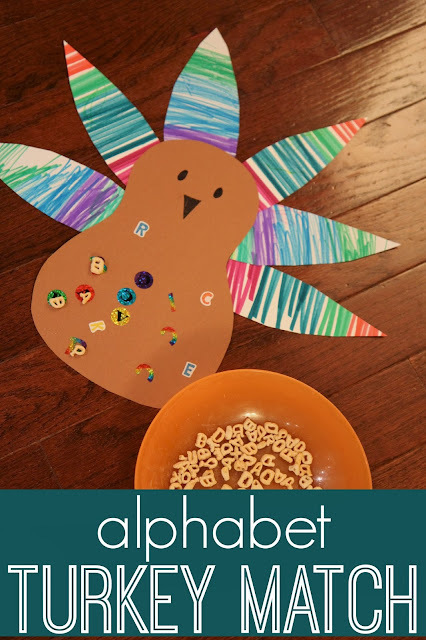 Grab some alphabet stickers and have your little one start covering the turkey with them! I love using stickers because peeling them off is a great fine motor activity. It can also be stressful if stickers are too thin and rip. Although I'd love to avoid meltdowns during activities, I think they provide great opportunities to work on resiliency and dealing with unexpected things/disappointments! We use these moments to practice asking for help. Once several stickers are on, then we choose a letter to look for and find an Alpha-Bit that matches on the of the stickers and we place it on top of the turkey. Once we match one letter, we pick another, and match again and again until all of the stickers are covered with Alpha-Bits (or whatever else you choose)! Then we eat them... and play again... or we add a few more stickers. This game is super simple and you could easily pre-make turkeys before Thanksgiving Day and then give your guests a bunch of alphabet stickers and the kiddos could work on this little sticker matching project while you get dinner ready.